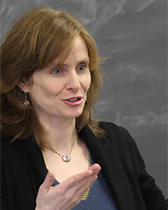 Kate Masur (Ph.D. University of Michigan, 2001) specializes in the history of the 19th-century United States, focusing on how Americans grappled with questions of race and equality after the abolition of slavery in both the North and South. Masur, a faculty affiliate of the Department of African American Studies, is author of An Example for All the Land: Emancipation and the Struggle over Equality in Washington, D.C. (2010) and numerous articles on emancipation and black politics during and after the Civil War. With Gregory P. Downs (UC-Davis), she co-edited The World the Civil War Made (2015), a collection of essays that charts new directions in the study of the post-Civil War Era. In 2018, Oxford University Press published her new edition of They Knew Lincoln by John E. Washington. This largely forgotten classic in Lincoln studies and African American history was first published by E. P. Dutton in 1942 and is the first book-length study of Lincoln’s relationships with African Americans, including members of the White House staff and Lincoln’s Haitian-born barber in Springfield, William de Fleurville. It offers a mosaic of stories, deep research on Elizabeth Keckly’s life and authorship of her 1868 book, Behind the Scenes, and vignettes of Washington’s own childhood in the neighborhood near Ford’s Theatre in Washington, D.C. Masur’s introduction to the new edition (excerpted here) explores John E. Washington’s life and work, as well as the book’s original reception and significance. Masur has extensive experience in public history and teacher education. She was part of the editorial team that created Reconstruction: The Official National Park Service Handbook, and she and Downs co-authored The Era of Reconstruction, 1861-1900, a National Historic Landmark Theme Study published in July 2017. Downs and Masur wrote about their NPS work in The Atlantic Online and The New York Times, and they co-edited a Reconstruction special issue of The Journal of the Civil War Era that includes a forum on the future of Reconstruction studies and a roundtable conversation on Reconstruction in public history and memory. Masur regularly leads teacher workshops at the Newberry Library and has served as a consultant on a variety of museum exhibits and documentary films. She has separately written for The New York Times, The Chronicle of Higher Education, The Washington Post, and The Atlantic Online on topics related to the Civil War, emancipation, the film Lincoln, and the history of the District of Columbia. Masur is the recipient of numerous fellowships and awards. In 2018-2019 she is on research leave courtesy of an NEH faculty fellowship and is a visiting scholar at the American Bar Foundation in Chicago. She is working on a book about police powers, the anti-slavery movement, and the origins of Reconstruction-era constitutional change. She has presented portions of that work at the National Archives, Brown University, Vanderbilt University, and other venues. A preliminary article based on her new research is published in the 2017 volume of American Journal of Legal History. Professor Masur is also affiliated with the Center for African American History, the Department of African American Studies, and the Program in American Studies. Editor, They Knew Lincoln by John E. Washington (1942), Oxford University Press, 2018. Editor with Gregory P. Downs, The World the Civil War Made, University of North Carolina Press, 2015. Editor with René Hayden, Anthony E. Kaye, Steven F. Miller, Susan E. O’Donovan, Leslie S. Rowland, and Stephen A. West, Freedom: A Documentary History of Emancipation, 1861-1867, Series 3, Volume 2, Land and Labor, 1866-1867. University of North Carolina Press, 2013. An Example for All the Land: Emancipation and the Struggle over Equality in Washington, D.C., University of North Carolina Press, 2010. “The People’s Welfare, Police Power, and the Rights of Free People of African Descent,” American Journal of Legal History, 27 (2017): 238-42. “Color Was a Bar to the Entrance: African American Activism and the Question of Social Equality in Lincoln’s White House,” American Quarterly, 69 (March 2017), 1-22. “The Problem of Equality in the Age of Emancipation,” in David W. Blight and Jim Downs, eds., Beyond Freedom: Disrupting the History of Emancipation, University of Georgia Press, 2017. Chair and organizer, “Eric Foner’s Reconstruction at Twenty-Five,” Journal of the Gilded Age and Progressive Era, 14 (Jan. 2015), 13-27. “Patronage and Protest in Kate Brown’s Washington,” Journal of American History, 99 (March 2013), 1047-1071. Participant, “Historians’ Forum: The Emancipation Proclamation,” Civil War History, 59 (March 2013), 7-31. “Civil, Political, and Social Equality: A Paradigm and a Problematic.” Marquette Law Review, 93, no. 4 (2010), 1399-1406. “The African American Delegation to Abraham Lincoln: A Reappraisal.” Civil War History, 56 (June 2010), 117-144. “A Rare Phenomenon of Philological Vegetation”: The Word “Contraband” and the Meanings of Emancipation in the United States, Journal of American History, 93 (March 2007), 1050-1084. Professor Masur regularly teaches undergraduate courses on the Civil War and Reconstruction and Abraham Lincoln, and U.S. Women’s History. She enjoys working closely with undergraduate students and has supervised several honors theses and worked with numerous Leopold Fellows. Many of her students have won Undergraduate Research Grants (URGs) to conduct independent research. Masur served as the History Department’s Director of Graduate Studies for four years (2011-14, 2016-17). She helped apply for and implement a Teagle Foundation grant to promote excellence in graduate student teaching and served a three-year term on TGS’s Advisory Council for Academic Affairs. Her graduate teaching and advising fields include the Civil War and Reconstruction, African American history, legal history, political history, and the history of women and gender. Her current Ph.D. students are working in all those areas.